$0.52 per Sq. Ft. / Mo. 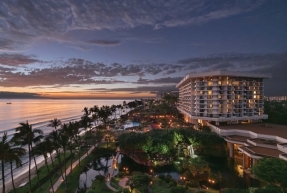 The Hyatt Regency Maui Resort and Spa is located along the beautiful and famous coastline of Lahaina. Situated on approximately 40-acres of impeccably landscaped beachfront property, the experience and breathtaking views provide locals and visitors with a lasting impression. Coupled with a relaxing atmosphere this luxurious resort also provides an abundance of amenities and activities to keep every type of guest satisfied. The resort has proven itself to be a highly desirable lodging option for many locals and visitors alike.